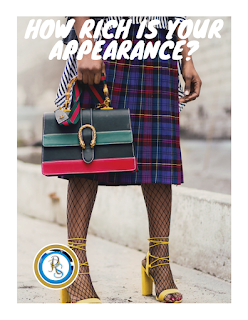 Home » » How Rich Is Your Appearance? How Rich Is Your Appearance? Hi gorgeous woman! Me? Yes, you! I hope your clothes for the week are well selected, classy and sophisticated? I, on the other hand, I’m totally worn-out with women who go out shopping for food items, looking like a regular person with low standards of cleanliness. When you ask these women why they are poorly dressed, they tell you, “Is it not just to buy something from the market and go back home?” or they say, “Who is looking at me?” These sorts of women do their errands or pick up their kids from school, looking like women with no morals, with all their ‘clothes’, bare as well as wear clothes with holes in them or with stain and their hair messy. What’s the challenge? Don’t these women give a hoot about what they wear or how they look like even to themselves? Are they lazy? Or do they simply lack money? I don’t buy such excuses! Money doesn’t help you to class up your look. Rich or middle class, women should take more care of their appearance and dress up more often. There is nothing wrong with dressing up and looking sophisticated even if it’s just to pick up your kids from school. Avoid letting your idea of ‘dressing up’ leave you looking like you belong on the street or you are from the gutter. Learn to groom and how to select your clothes in a way that will help you appear classy and sophisticated. Let us help you select styles that will play up a value image with our 'Style Well Packaged for Success Training Course.' For inquiries about this course, call us on 08170768650. Are Bad Times Really Bad? Grind Down In the FAILURE Zone?